Florida's new Education Commissioner ordered immediate action to fix a "significant educator certification backlog." TAMPA, Fla. — Florida's newly appointed Education Commissioner, Richard Corcoran, has ordered immediate action to fix what the department describes as a "significant educator certification backlog" in a statewide press release issued late Tuesday afternoon. 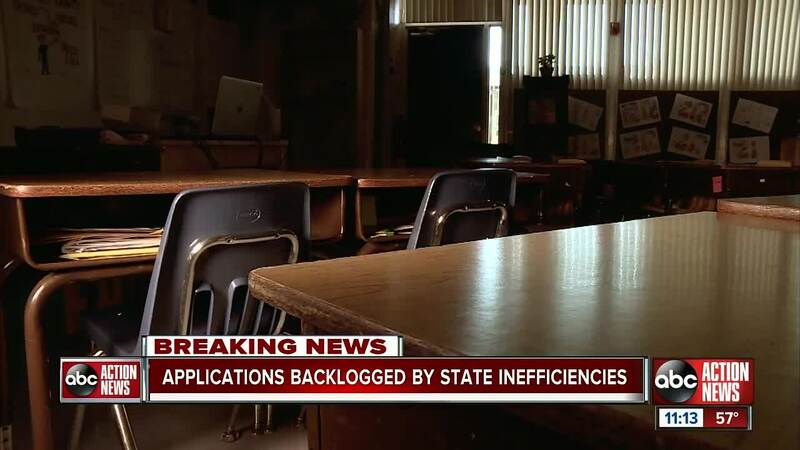 The release follows questions and records requests submitted by I-team reporter Katie LaGrone last month focused on the state's backlog in in processing teacher applications. Florida classrooms remain short 2,217 teachers according to the Florida Educators Association, the state teacher's union. According to the union, the current shortage is roughly 700 more than at the same time last year. Despite the desperate need for teachers across the state, we found thousands of aspiring teachers stuck in limbo, waiting months for the state to process their applications. 24-year-old recent college graduate Jesse Yarbrough, planned to start teaching English last fall but was forced to change course when Florida's Department of Education had not processed his application in time to issue him a letter of eligibility. "It's just a piece of paper that says you can get hired, how long am I going to have to wait," he told us several weeks ago. Yarbrough submitted his application last summer. "If you looked at June 19, the day I put in my application, you would be looking at 205 days as of right now," he said. When asked if there was something wrong with his application, he told us he called and a state rep said everything was perfect. As for whether the state provided him a reason for the delay, he replied "no, they just told me that they're very backed up and that they will get to me, eventually." We discovered Jesse is one of 25,000 applicants still waiting for the state to process his application. 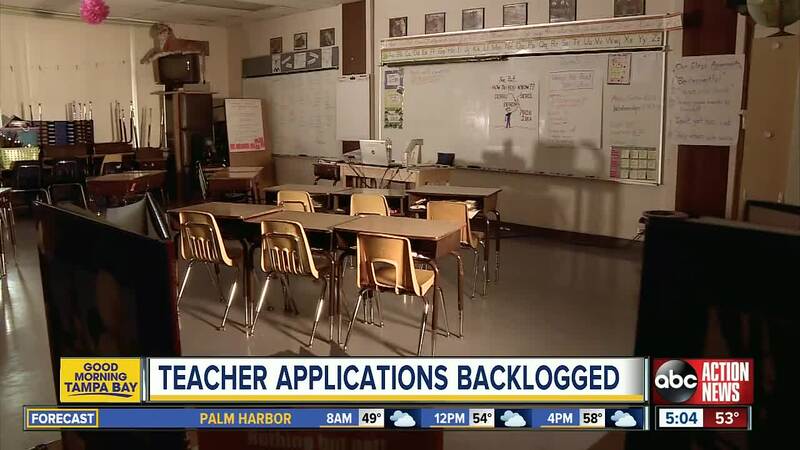 The backlog is also delaying the certification of another 15,000 teachers who are currently working in Florida classrooms. A certificate or temporary certificate is mandatory to teach in a public school in Florida. "It's strange that you [state] say you are desperate for teachers and that you need teachers so badly but what you're doing is entirely the opposite. I mean I'm willing and I'm able to teach," said Yarbrough. "It's not appropriate," said FL Republican Representative Byron Donalds of Naples when we asked him about the delays. Representative Donalds heard about the backlog from frustrated constituents who also found themselves on hold due to the backlog. Donalds is now advocating for a more efficient process. "How do we readjust this process to make sure we still have information control and data control with a person or this gentleman while at the same time having a process that happens much, much faster," he said. According to the press release issued by the FL Department of Education (FLDOE) on Tuesday, the state implemented a new educator certification system in November of 2017. Since then, wait time has increased while the number of certificates issued dropped by 55%. We started asking questions about the application process more than one month ago after Jesse Yarbrough's father contacted us. A spokesperson with FLDOE immediately acknowledged the delays and sent us an email explaining how they have people working overtime and have added additional staff to catch up with all the applications. A day after we interviewed Jesse Yarbrough, we asked a state spokesperson why his application was taking so long to be processed. A few days later, we learned he finally received his letter of eligibility to start his career in a Florida classroom. It only took 6 months and 26 days. In a statement, Education Commissioner Richard Corcoran said the issue is now a top priority, "Upon taking the helm, I became aware of an inefficiency and began immediately developing solutions." Corcoran says the department will eliminate the backlog within 120 days. He has implemented the following actions. For the past two years, Investigative Reporter Katie LaGrone has reported on problems surrounding Florida's teacher certification process. To see her coverage click here .